“Roseanne” is a hit, again. The ratings of the back-to-back episodes that launched its much-belated 10th season debut March 27 were, in today’s thin-sliced television landscape, impressive and historical: 18.1 million viewers, rising to 25 million with delayed viewings. Last Tuesday’s second-week figures fell off some, as expected, to a still-impressive 15 million. A second season has been ordered. As stars of powerhouse sitcoms go, Roseanne Barr is, to say the least, out of the ordinary. In the time before her return to media center stage, she had been a busy presence, exhibiting a mind susceptible to conspiracy theories and quixotic readings of the president’s intentions. Her credulousness – she would of course characterize it differently — does not set her apart from Americans on both ends of the political spectrum who fearfully regard the world as a plot against them and what they hold dear, of wheels turning behind wheels turning behind wheels, so complicated, so simple. There are too many hot buttons attached to ABC’s “Roseanne” for it not to have become the subject of loud public debate; given the profile — especially the online profile — of its star. There was no chance that reaction to the series would be other than charged, widespread and politicized. If these are polarized times, when not to choose a side can be seen as choosing the other, wrong side, they are also performative — opinions have become capital. We are all out there saying what we think, in a war of clashing certainties. And many people want a piece of this. The show has been politicized less by its content than by virtue of it arriving at a moment that demands we see everything as political. Barr has at times encouraged this reading (“J edgar comey, millions of ‘feminists’ marching in support of women’s subordination,& leftys opposing Russia? gr8 time 4my new/old tv show!”), but also discouraged it. Even before the revival premiered, I didn’t have to look far, in my own social media feeds or in website comments sections, to find friends and strangers declaring that from what they’ve heard, nothing could induce them to watch the series. (Some, to be sure, wanted the world to know they had never liked “Roseanne” to begin with.) Even to give it a try, the implication was, would be to give comfort to the enemy. Of the many millions who have watched the show, it is safe to say that many millions of them have not followed its star’s adventures in political thought. We might have a vague idea of a celebrity’s politics — and take it for granted that Hollywood leans left — but most of us are not paying that much attention, and often when we do know, we find reasons not to care. In any case, the driving force behind the revival was not Barr but Sara Gilbert, who plays Roseanne’s daughter Darlene, and the mother of new characters Harris (Emmy Kenney), a mouthy teen, and Mark (Ames McNamara), a gender-fluid grade-schooler. I can’t tell you the specifics of Gilbert’s politics, but the political figures she follows on Twitter, including Barack Obama, Hillary Clinton and Bernie Sanders, are all on the left. The writing staff, headed by Bruce Helford (back from the original, from which Barr fired him) and Whitney Cummings, is reportedly diverse, in all the usual meanings of the word. The point of the Conners, like most television families, is not that they stand for a whole class of people but that they are individuals whose company, and whose conflicts, we find stimulating or comforting. We may share some of their circumstances or opinions or behaviors, but like our own families, we are aware that they are unique, identifiably human but indefinable merely by wealth, race, gender or politics. They don’t agree on everything, and to make them stand for White Working-Class America, whatever that is, is as quixotic as Barr’s belief that Donald Trump is a supporter of LGBTQ rights. 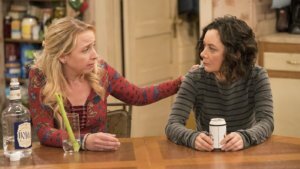 Some critics have seized on particular lines (a joke about ABC’s “black” and “Asian” comedies, Roseanne’s seeming endorsement of spanking) to prove the point that the show is regressive and has been brought back merely to carry water for the Trump administration. (Trump himself seems to think there is something in this.) Others have declared it a blow against Hollywood liberalism. But these are small things in a larger sea. It’s not necessary to like every joke or expressed attitude to admire the show. (I do.) Like the people it portrays, it’s complicated. What makes “Roseanne” work for a wide array of viewers is that these people have sides; you can’t boil them down to a stereotype. They don’t stand for White Working-Class America, which has become erroneously synonymous with Trump’s America, any more than they stand for the Hollywood production process that gives them life. The Conners are only the Conners, the product of nine years of communally created life, conversations in writers rooms, acting choices and the demanding woman whose name the series shares. Indeed, what’s impressive about the revival is how clearly the characters cut through the fog of extra-textual controversy. There are times when television romanticizes the past and times when it idealizes the future, in either case showing us a kinder, better, more inclusive world than the one we’re living in. At other times, it shows us something more akin to the world as it is. “Roseanne” hits all those notes. It’s both old-fashioned — a family comedy in which lessons are learned and love is shared by an episode’s end — and, in its doomed-to-struggle way, aspirational. Its point, both within the show, as a work of art in the world, is that you make allowances for people you love, even as you hold them to account.